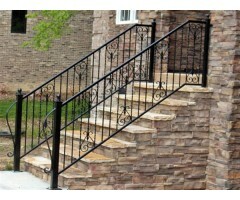 The homeowners on this project wanted a simply elegant rail to compliment their beautiful stone entry, so we used a decorative component every 5th vertical bar to give it just the right amount of element with a long sweeping "lamb's tongue" on the front newel post to follow the small scroll curve on the decorative designs. ..
Large decorative square collars on each vertical twisted bar between C-Scroll panels and finished with the large twisted coordinated newel post makes this a beautiful combination. 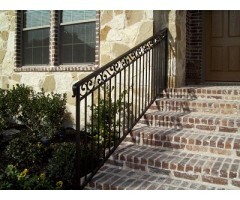 ..
A "classic" handrail with its decorative component every 4th vertical. .. This entry deserved an impressive statement hand rail design complete with a barrel volute to put the final touch on this luxury home. .. 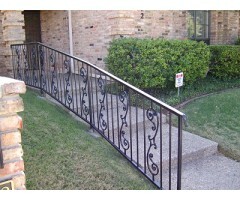 This entry says "welcome" with the flared hand rail adorned with a scroll border under the handrail. .. 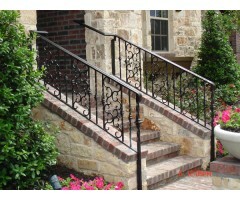 The sidewalk with large graduated stairs up to this home's entry was fitted with a beautiful hand-rail designed with a decorative scroll design each 4th member with a small lamb's tongue on the end of the top rail. .. 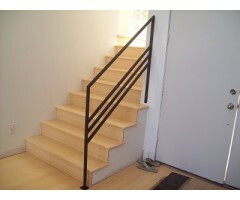 Contemporary styled rail to offer safety and style to this stair. .. 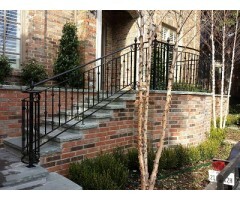 Exterior entry stair hand rail with a beautiful top scroll border under the top rail complete with a lamb's tongue end. 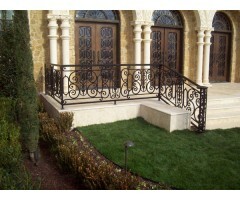 ..
An architectural masterpiece, complete with rail around the upper balcony detailed with a heavy gauge top rail with an O ring border framed with decorative detail on the vertical design. 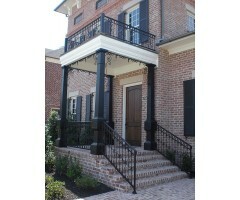 Along the ceiling of this porch we created a valance friezes with interesting dropped detail and corner post accents. 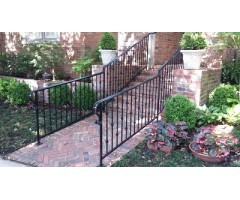 The lower hand rail was coordinated with a smaller design component on the vertical but a matching O ring border and top rail. .. 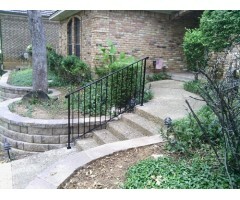 This classic vertical hand rail compliments the curved line landscape details. .. 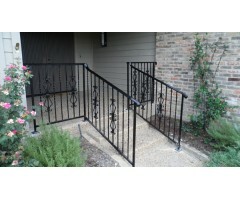 Alternating collars are perfect for this top and bottom framed rail with a gorgeous barrel volute at the starter step. At the top of the landing we created a curved rail to follow the line of architecture which gave a visual softness to the lines of this home. 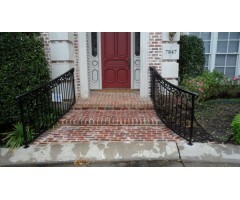 ..
With the geometric pattern on the brick walkway, this alternating collar design is a perfect complimentary rail to complete this entryway. ..